JetBlue and POSSIBLE Mobile have won the Webby People’s Voice Award for Best User Experience in the Mobile Sites & Apps category of the 2018 awards. The JetBlue app was also nominated for Best Travel App. The app has attracted over 9 million downloads. 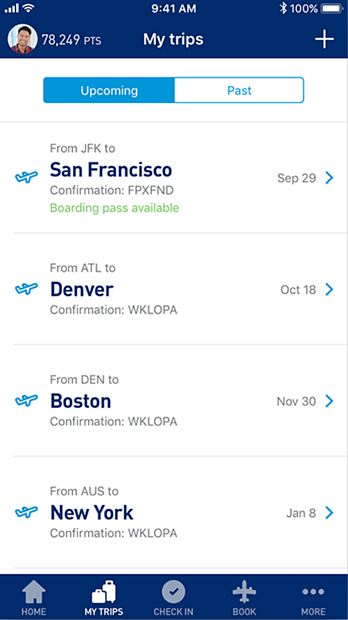 The JetBlue app makes booking and travel easy, providing convenient features, including a paperless mobile boarding pass to expedite the travel journey. Customers can utilize a range of additional self-service options via mobile services, such as changing or cancelling flights, adding ancillaries, upgrading seats, updating traveler information and emailing an itinerary. 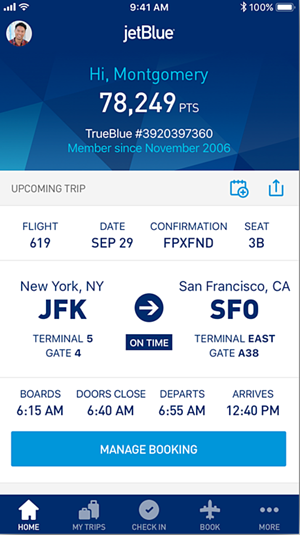 On the home screen in the JetBlue app, users can find flight details including their flight number, flight status, flight times, gates, and more. From this home screen, users can also view their TrueBlue account points and navigate to the "Manage Booking" feature. On the day of travel the travel card on the home screen updates to allow users to check in, access airport maps, and find travel amenities like the DirecTV schedule, ride share integration, and the weather information for the user's final destination. Our comprehensive boarding pass includes useful information such as boarding and doors closing times as well as passenger-specific visual indicators such as TSA Precheck, JetBlue Mosaic membership, extras such as Even More Speed, etc. 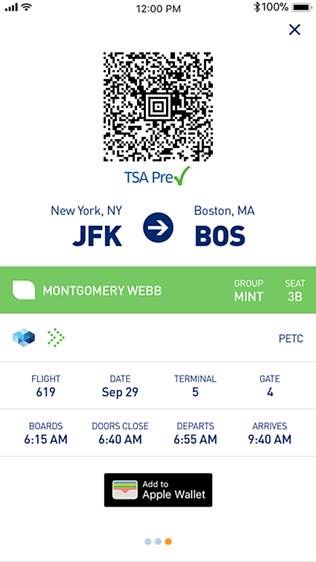 Once users retrieve their boarding pass from within the app, they can add it directly into their Apple Wallet for quick access and use the scannable code for boarding. 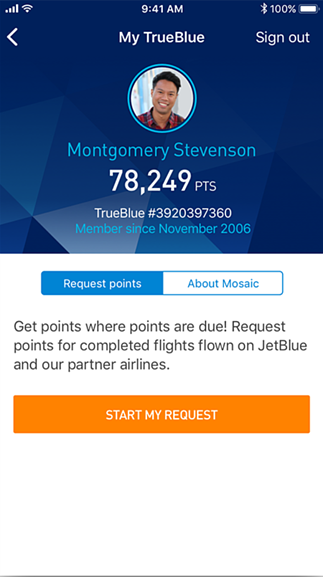 Through the app users can also manage their TrueBlue accounts to keep track of their mileage points and request points for past trips. Lastly, the 'My trips' tab allows users to view upcoming and previous trips and quickly see details such as confirmation numbers, travel dates and boarding pass availability.